Some saw the move back to monohulls for the 2021 America’s Cup as a shift of emphasis from high-tech to more traditional sailing. But the foils put paid to that. Sitting out of the water, the 2021 boats will be able to hit up to 50 knots – or 92.6km/h in land-lubbing terms. The 75-foot foiling monohulls will need a lot of tech in their design process, and operation – or, quite simply, somebody’s going to get hurt. “The G-forces in the tight turns will be phenomenal,” Emirates Team NZ design head Dan Bernasconi says. 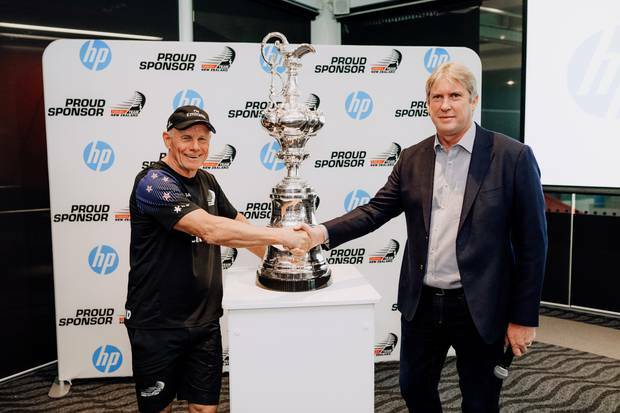 And so it is that tech company HP has signed on as an official sponsor for Emirates Team New Zealand. The multinational has supported Team NZ before – but was an official supplier in Bermuda – but this time it’s both cash and kind and it’ll be the first time HP gets its logo on the boat as it upgrades to official sponsor. HP NZ managing director Grant Hopkins won’t put an exact figure on the deal, but says it runs to the “single-digit millions”. Speaking to the Herald ahead of today’s announcement, Bernasconi said designing America’s Cup boats used to rely to a large degree on intuition, plus real-world tests. But now the days of creating a physical model then putting it through its paces in a wind tunnel or drag tank are gone. Design has gone all-digital. Cue a bank of HP workstations and servers. Bernasconi showed the Herald some prototype “honeycomb” for AC75’s hull created by an HP 3D printer, using nylon. Emirates Team New Zealand CEO Grant Dalton and HP New Zealand Managing Director Grant Hopkins at today’s sponsorship announcement. Photo / Supplied. The honeycomb – of which no photos are allowed – is not currently part of Team NZ’s construction plan but Bernasconi says it shows where things are heading. The honeycomb sits between two sheets of carbon fibre, and the 3D-printed nylon prototype is lighter than traditional materials like aluminium of kevlar and can be moulded to the shape of the hull in areas with intricate geometries, the lead designer says. Bernasconi adds that an HP 3D printer is also being used to create test versions of mechanical components for controlling the boat’s sail. It’s a quick, easy way of making prototypes, and could end up being used for the real thing. 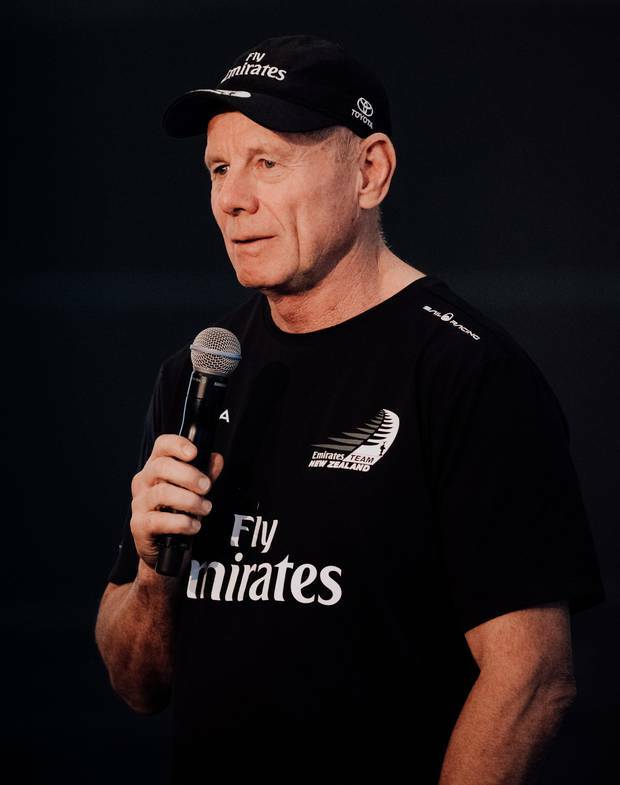 Emirates Team New Zealand CEO Grant Dalton. Photo / Supplied. 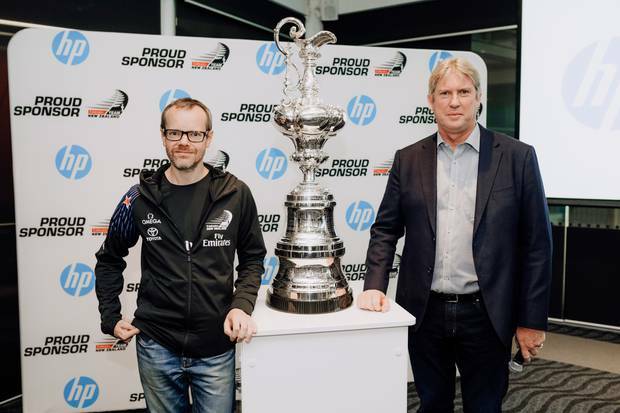 Hopkins says HP’s Jet Fusion 3D 4200 printer – the model employed by Team NZ – is also being used by North Canterbury motor racing specialist Rodin Cars, and Australian-based iOrthotics, which develop custom-made orthotic devices for podiatrists. We’re not talking a $300 consumer 3D model, incidentally, the JetFusion line begins at around $295,000 – though it’s billed as 50 per cent cheaper than more traditional industrial design alternatives, and faster. HP will also work on signage for sails – necessary to pay the bills, though Bernasconi notes that other teams can do without logos (however lightweight) full-stop because of their billionaire backers. “We’re the only team that’s really commercially funded. The other big teams have a much higher percentage of private funding so don’t rely on as much branding or sponsorship,” Bernasconi says. “The engineers are always debating the amount of branding on the boat, because everything has a weight, but we understand who’s paying the bills,” he adds. HP’s logo will be on the foil, where it won’t be affecting this aerodynamically. Hopkins says it was chosen because it was the most high-tech component. Emirates Team New Zealand Head of Design Dan Bernasconi and HP Managing Director Grant Hopkins. Photo / Supplied. How is Team NZ tracking overall? “We’re well into construction of our first AC75 yacht at our own yard,” Bernasconi says. “And that’s going very well. No major hiccups. “The bottleneck at the moment is the supply of the foil arms. “There are a few components that, for cost-saving reasons, will be standard-supplied for all teams – and the foil arms are being designed by Luna Rossa and built by a yard in Italy.